A challenge was made a year ago for a team to release the stranglehold Teddy Bradley and Mark Fennell held on the R & B Bass Circuit. After winning the points in successive years (2011 & 2012), they had established themselves as the premier team in Michiana. 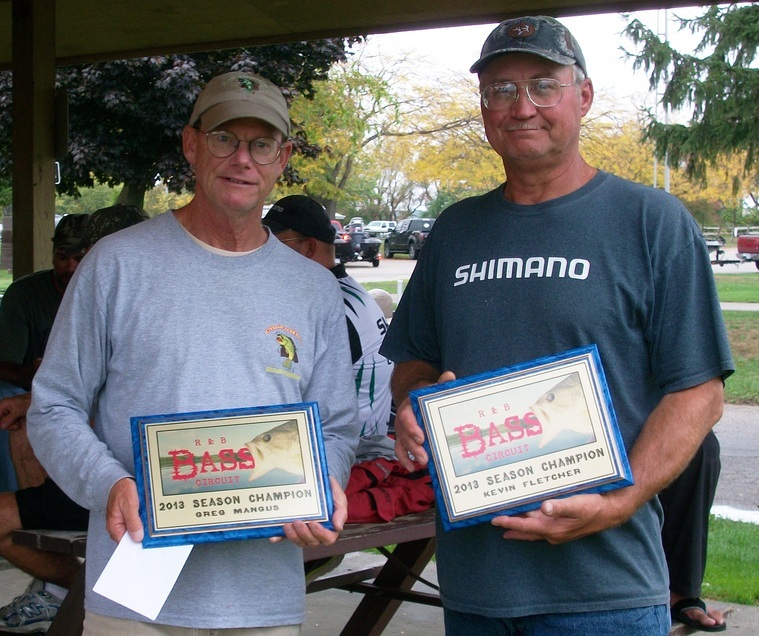 Perhaps an answer to prayer, or just a casualty of time, Bradley took a job that cut into his Saturday fishing time, thus his absence from the 2013 field opened the door for a new team to claim the honor and a team did more than claim. top 5 of each event (never before done), they shattered the record of most points in a season by more than 34! They are nearly synonymous with the R & B record books, now boasting the most top five finishes (12 - five more than second place), second for most victories (3), and have won $6,639 ($2,299 more than second). Their performance at Randall Lake in July was the biggest blowout in history and also the second heaviest weight ever recorded. The 77.55 pounds they brought to the scales is also a record. 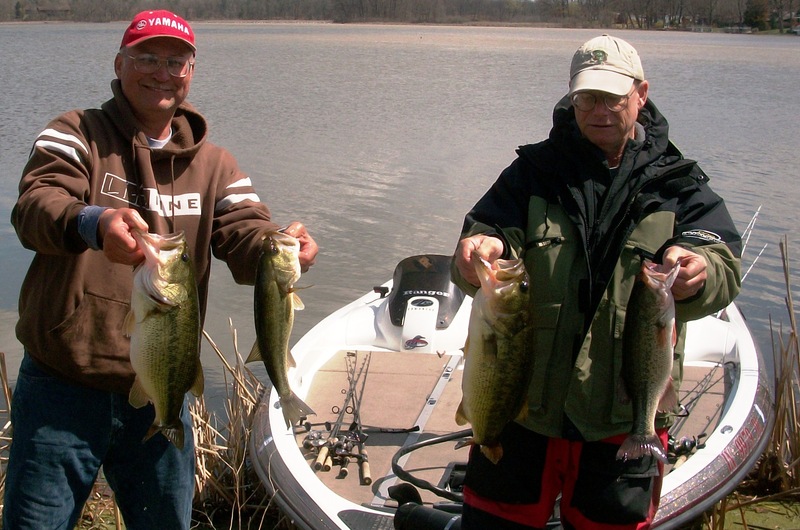 Fletcher (left) and Mangus began the season with a second place at Webster Lake by landing over 15 pounds despite snow, strong winds, and significant mud. The champions’ consistency went under the radar early in season as it was overshadowed by Ron Fabiszak’s three consecutive victories. But these victories were not enough to hold off Mangus and Fletcher because their finishes kept them dangerously close (2nd at Webster; 2nd at Tippecanoe, 4th at Wawasee). A single slip up at Randall allowed them to claim the lead and they never relinquished. In fact, they gained at each successive tournament winning by a total margin of 58.95 points. Webster Lake: April 20, 2013. 2nd Place - 15.89 pounds. $454. Lake Tippecanoe: May 18, 2013. 2nd Place - 11.16 pounds. $460. Lake Wawasee: June 15, 2013. 4th Place - 10.96 pounds. $292. Randall Lake: July 20, 2013. 1st Place - 18.88 pounds. $854. Austin Lake: August 17, 2013. 5th Place - 10.67 pounds. $198. St. Joe River (Benton Harbor): September 7, 2013. 2nd Place - 9.99 pounds. $542. 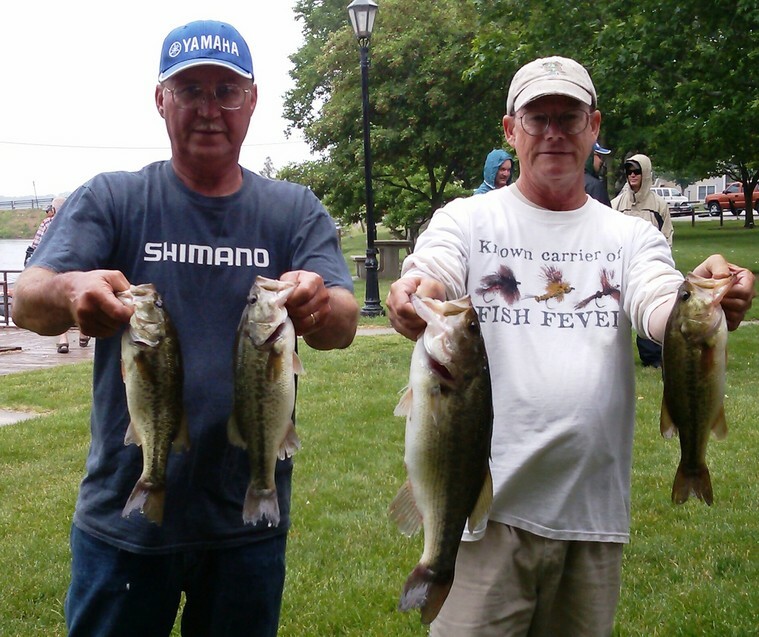 Mangus fished with a substitute on Tippecanoe and finished second. His consecutive second place finishes were overshadowed because of Fabiszak's and Nelson's consecutive victories. because of their ability to adapt to the challenges at hand. The mutual respect they have for each other’s skills impacts how they approach each day, but this was not always the case. Fletcher recalls, “Twenty years ago, [when fishing with Mangus] I would say, ‘Whatever you want to do today,’ and I would just go along. Today, it goes both ways.” “Trust” is the most important element of teamwork to Mangus. “You have to trust each other’s ideas, and then do them. We are constantly feeding off of each other’s ideas, and we never say ‘No’ to each other.” Fletcher reveals that after fishing together for 20 years, “I still learn something from [Mangus] on every trip,” and Mangus claims the same. Despite Fabiszak's & Nelson's three consecutive victories, they could not shake off Mangus and Fletcher as they logged a top 5 in each event as well. On top of Fletcher’s list is preparation. “It is everything,” he claims. “Some things you cannot control, but many you can. For example, I cannot remember the last time a fish broke my line. When that happens, one of two things happened: either bad line or rod. Each of these can be avoided 100% of the time.” He adds preparing tackle and checking everything on the boat beforehand is essential and now habit. Part of their strategy includes utilizing each other’s strengths. Few have the experience on the Randall Chain that Mangus has, thus they took his boat and mostly followed his lead. However, those roles were reversed on the St. Joe River for the same reasons. Furthermore, Mangus admits Fletcher is more efficient at working docks, so when targeting them, Fletcher will run the trolling motor regardless of whose boat. It is vice versa when they sling crankbaits. A record setting performance at Randall Chain was the end of Fabiszak's and Nelson's reign. New leaders were on the board and they never let up. 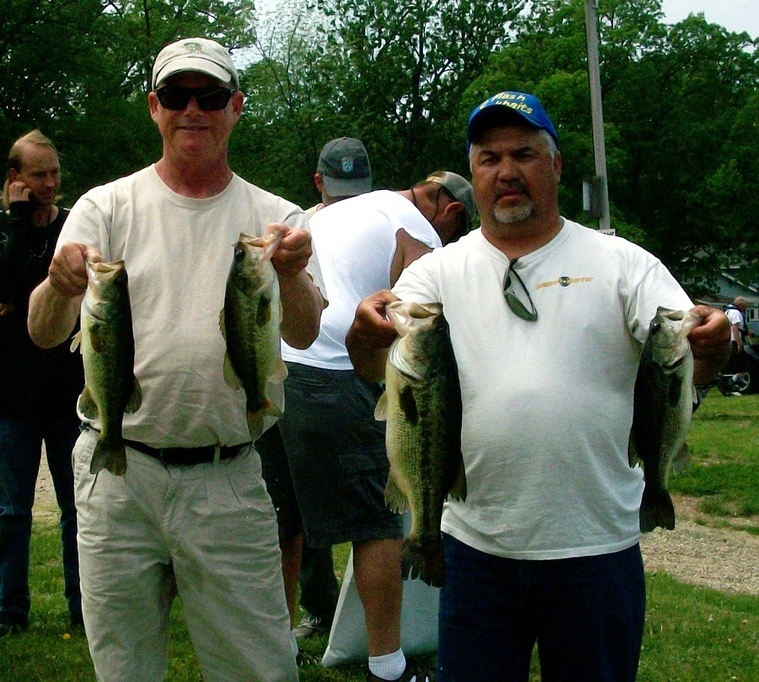 The champions should be smiling after the Austin Lake tournament. 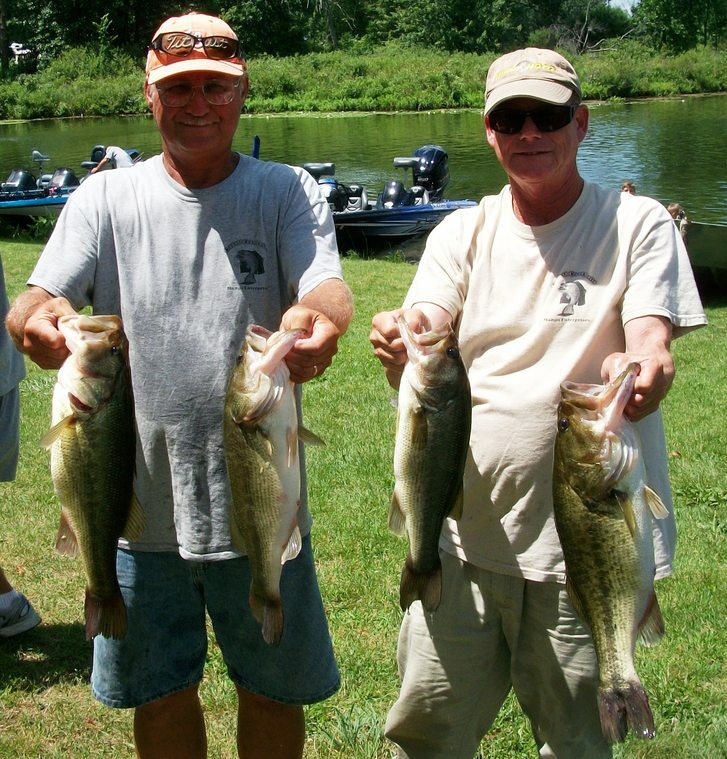 They tied for fifth place, but their big fish placed them above Steve Kline and Mark Farver. They also credit the jig for being a diverse bait. 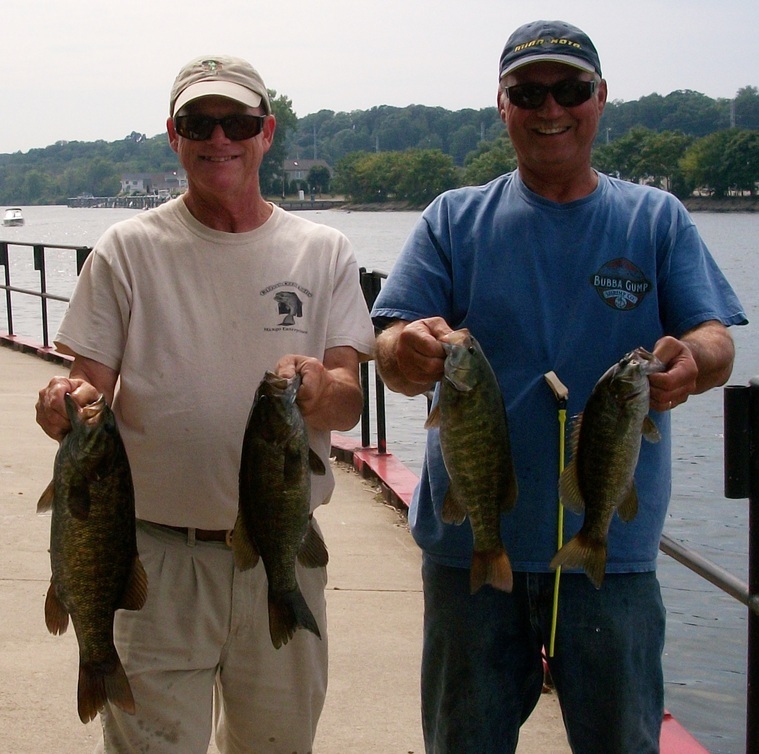 “Fish really key on bluegills and crawfish around Michiana, and the jig can mimic both,” explains Fletcher. When fish are keyed on bluegill, he works the jig with fast hops or swims it. However, when mimicking crawfish, he works it slowly or even drags it along bottom. Greg Mangus and Kevin Fletcher have long been considered a top team in Michiana. Winning “the best circuit with the best competition” arguably makes them the top team. But adding to their influence on our area is their reputation as people. 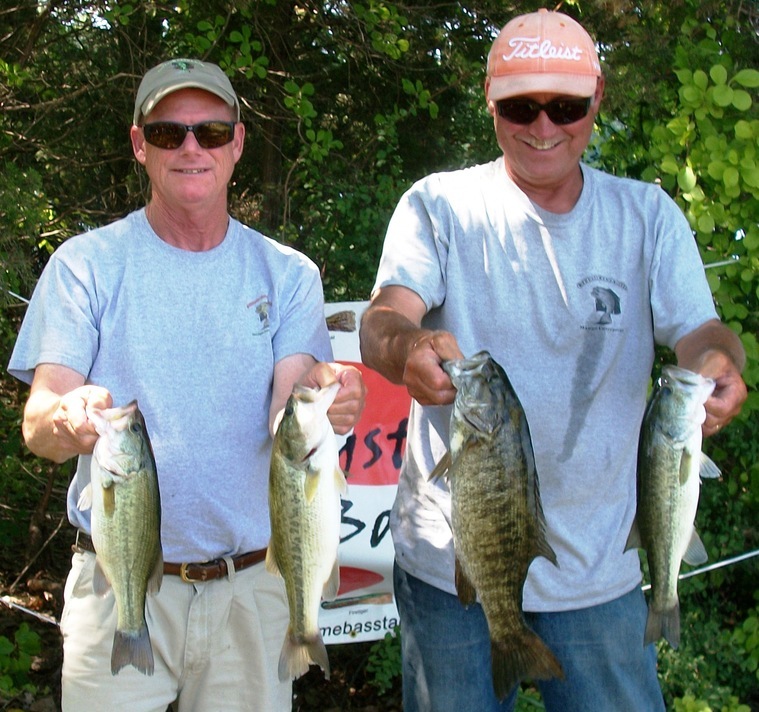 The 2013 Points Champions are also heralded as humble anglers who help others regardless of skill level. A review of the mass information they have made available for R & B members on this website confirms this. They are ambassadors for the sport, and they kicked our butts all year with a smile.